Marcus Maddison in action for Posh against Spurs. Photo: Joe Dent/theposh.com. A late Kyle Vassell strike earned Peterborough United a hard-fought 3-2 win over a Spurs XI at the ABAX Stadium today (July 18). All three Posh strikers netted as the goals continued to flow for Dave Robertson’s men. A Joe Gormley strike and a tidy finish from Connor Washington put the home side in control before Spurs substitutes Ismail Azzaoui and Shayon Harrison got the visitors on level terms. However a short range effort from Kyle Vassell five minutes from time ensured a third Posh victory in four friendlies. The first sight of goal for Posh arrived on 13 minutes when Collison played a crafted ball to Washington whose cushioned head was fired wide by Jon Taylor. Ben Alnwick then had to be on his guard on 16 minutes to tip over a Cy Goddard free-kick that was heading for the top corner. Gormley gave Posh the lead on 26 minutes when he slotted home an inch perfect Michael Smith cross following clever build up play from Collison. The former West Ham man was withdrawn from the action after an impressive 36 minutes with another important step completed in his recovery process. just before the break after good work by Kgosi Nthle down the left flank. 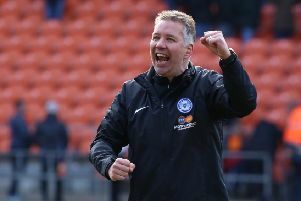 Posh doubled their advantage shortly after the re-start, Washington wriggled clear following some poor defending and rounded the keeper before slotting home. Alnwick had to be at his best on 49 minutes when McEvoy cut in from the right and fired a shot at goal only to find the Posh shot stopper’s leg in the way. Spurs did find a way through on 57 minutes when Harrison hit a well struck shot from outside the area past Alnwick after being given too much time to pick his spot. Following 10 team changes on 60 minutes, Posh struggled to establish any rhythm or create any chances. Spurs however were in the ascendancy and Assaoui pounced on some poor defending by Joe Newell to bring the scores level on 78 mins. Posh finished the game well though and tested the visiting keeper on numerous occasions as the home side looked to re-establish their lead. The home side found a breakthrough with five minutes remaining through Kyle Vassell who made no mistake when he ended up with the ball inside the six yard box to ensure another result that left manager Dave Robertson and a decent-sized ABAX crowd in cheerful mood. Posh (first 60 mins): Alnwick, Smith, Zakuani, Santos, Ntlhe, Maddison, Collison (35 mins J.Anderson) Bostwick(c), Taylor, Washington, Gormley. Posh (final 30 mins): Henry, Trialist, Brisley, Maslen-Jones, Adebayo-Rowling, J.Anderson, H.Anderson, Newell, Trialist B, Vassell, Trialist C.
Sterling (sub Harrision, 45 mins), Goddard, Sonupe (sub Azzaoui, 45 mins)).